At the recent Tech Field Day 10 event, I spoke with Platform9. They offer a managed OpenStack service that ties into your on-prem infrastructure. Platform9 is the simplest way for organizations to implement an OpenStack-based, agile, self-service private cloud, with intelligent self-service provisioning of workloads onto their private infrastructure. 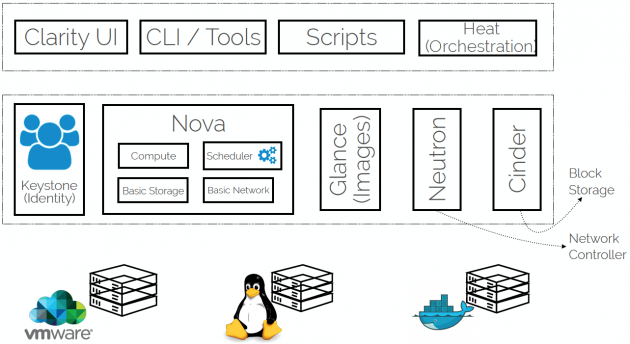 With Platform9, organizations can go from just a bunch of virtualized or non-virtualized servers to a fully operational, OpenStack-based cloud in a matter of minutes. Platform9 significantly reduces operational complexity of managing your OpenStack environment by automating all parts of private cloud management. Platform9 is built by VMware veterans with years of experience building core virtualization and infrastructure management software. Platform9 was created with the vision to significantly reduce operational complexity in managing virtualized datacenters and transforming them into nimble, next-generation software-defined datacenters. Platform9 strives to bring enterprise-grade private cloud experience to enterprises. So what is so cool about Platform9? Basically, they disprove ‘that OpenStack is hard’. They’re following suit in offering a way of making OpenStack simple, just like many other companies like ZeroStack, Mirantis and SwiftStack. The difference with many of them, however, is how and to whom they offer ‘easy OpenStack’: by offering OpenStack as a Service instead of an installable (Linux) distribution on-prem to enterprise infrastructure shops running enterprise virtualization stacks. So really, it’s aimed at every enterprise (small or large) that runs vSphere and is looking at OpenStack. It is managed, maintained and patched by Platform9. No need to worry about complex patch preparations, etc.. For each customer, Platform9 instantiates an isolated instance of OpenStack. It is protected by an operational Service Level Agreement with guaranteed availability, performance, security, etc. It is multi-tenant by nature with two levels of tenants: the organization contracting an Platform9 OpenStack ‘instance’ and the tenants you create within that OpenStack instance. This is very useful for Managed Service Providers! I’m impressed by how focussed Platform9 is in their product delivery. They know really well what use case they enable, and stick with it. This makes their product easy and simple to use. It’s not a Swiss army-knife full of tools you won’t ever use, but the features they do incorporate are well though-out and match the challenges infrastructure admins have in deploying and managing OpenStack. This means more traditional shops now have the easy option to deploy OpenStack while maintaining full control over their infrastructure, preventing the infra teams from having to change how they work and what tools they work with. Pretty clever, if you ask me! Their developers require OpenStack APIs because they want to standardize their Continuous Integration, automated build and desired state configuration tooling on these APIs. They are looking at a proven multi-tenant IaaS Cloud Management platform with programmable self-service capabilities because the organization has multiple departments or teams consuming infrastructure resources. OpenStack compatibility is less of an issue for this use case. The bigger picture is the whole of components making up the Platform9 Managed OpenStack service, including the SaaS bits, the on-prem infrastructure, the gateway connecting the two and finally the users (both IT and end-users). In the next posts, I’ll deep-dive into the various components that make up the architecture, but I want to leave you with the first thoughts on the solution. Platform9 does seem to make OpenStack simple, both in terms of deployment, but also in terms of managing it: patching, configuration, optimization, troubleshooting, etc. by offering it as a service. Based on the architecture (on which I have done a deep-dive), it is well aimed at the enterprise customer running vSphere. 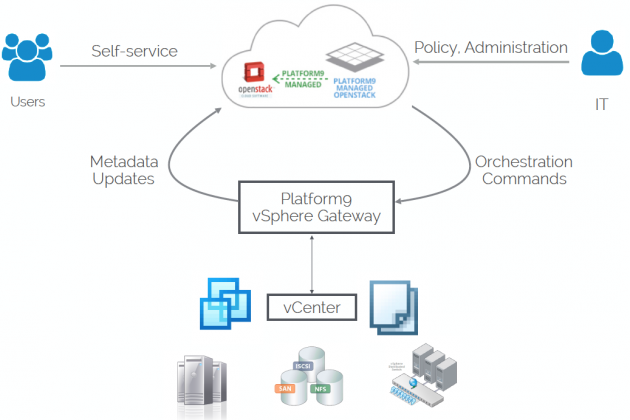 It is capable of leveraging vSphere, abstracting away from it into the portal but integrating with vSphere where it matters. I’m not sure betting on just OpenStack is the smartest way to go, given the rising popularity of Linux Containers and Unikernels. I have written a separate post on this subject: Can Platform9 solve fundamental OpenStack challenges?